Hate crimes are rising, but documenting them may help stop them. The film "Breathin’: The Eddy Zheng Story" prompts discussion on the issues affecting Long Beach's Asian American and Pacific Islanders, including schools, deportations, and refugee trauma. "I am an Immigrant" gathered over 400 people Saturday in Los Angeles to mark Immigrant Heritage Month. The gathering came just before today's Supreme Court ruling on President Obama's immigration programs. 185,000 undocumented children are expected to benefit from the expansion, according to state agencies. Workers have celebrated May Day, or International Workers' Day, since the 1880's. 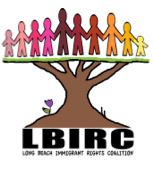 On Sunday, Long Beach workers and immigrants rallied to say their struggle is not over. The Mexican national is a recipient of Deferred Action for Childhood Arrivals (DACA), the program announced in 2012 that allows certain undocumented immigrants who came to the U.S. as children to get a reprieve from deportation, and a social security number and a work permit. The Khmer Girls in Action event 'Not Home for the Holidays' took place at McBride Park that day and held a discussion on the local impact of deportation. They shared ideas on how to keep families united. After hearing heart-rending testimonials from three young undocumented immigrants who have seen first hand the havoc caused by not having access to health care, the Senate Health Committee voted 7-0 to provide health care to all Californians, regardless of their immigration status. L.A. County Sheriff's Dept. officers will no longer be able to act as federal immigration enforcement, according to a recent vote by the Board of Supervisors. April marked the 100-year anniversary of the Armenian Genocide. Approximately 1.4 million Armenians live in the United States, one million of which live across L.A. County. What makes Latinos so susceptible to immigration scams is that many scammers describe themselves as “notarios,” commonly known in Latin America as attorneys. But many posing here as “notarios” may not be attorneys at all.